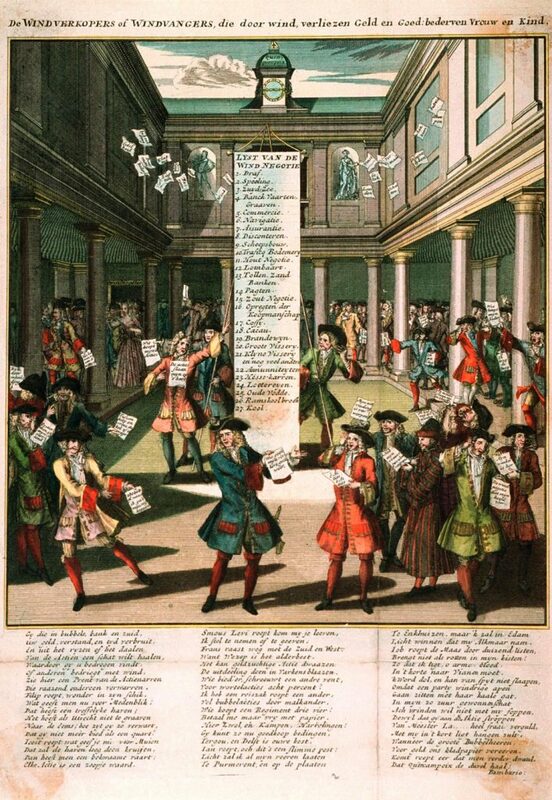 Around 1720, many manifestations of satire, which warn of the danger of the speculation virus from England and France, are published. 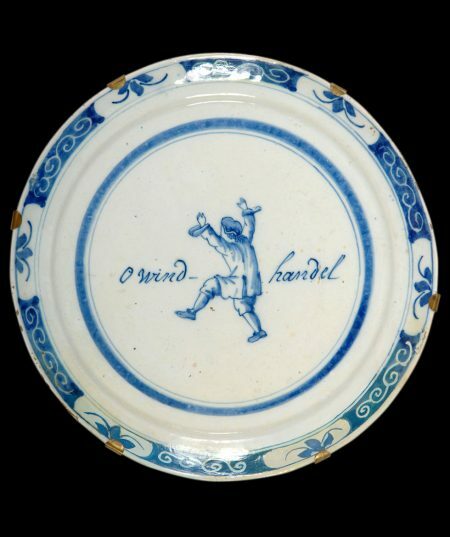 Here, a Delft blue ‘crisis plate’ is depicted. The highlight of the satire on the wind trade was ‘Het Groote Tafereel der Dwaasheid’ (The Great Picture of Folly), a compilation album of pamphlets, poems, business plans, and prints, such as this print that mocks the wind companies’ trade in shares (‘actien’). Eventually, ‘wind companies’ were also established in Dutch provincial towns. Unlike in England, they remained limited in number, and, in addition, it turned out not all of them were unrealistic in the long run. One of them, Stad Rotterdam, still exists as part of insurance group ASR. 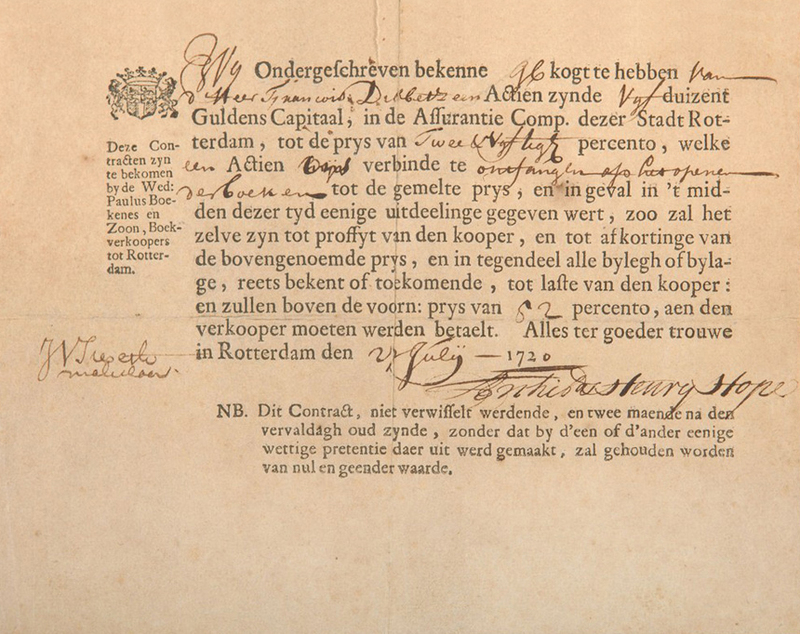 Here, a 1720 option contract of Stad Rotterdam is depicted. 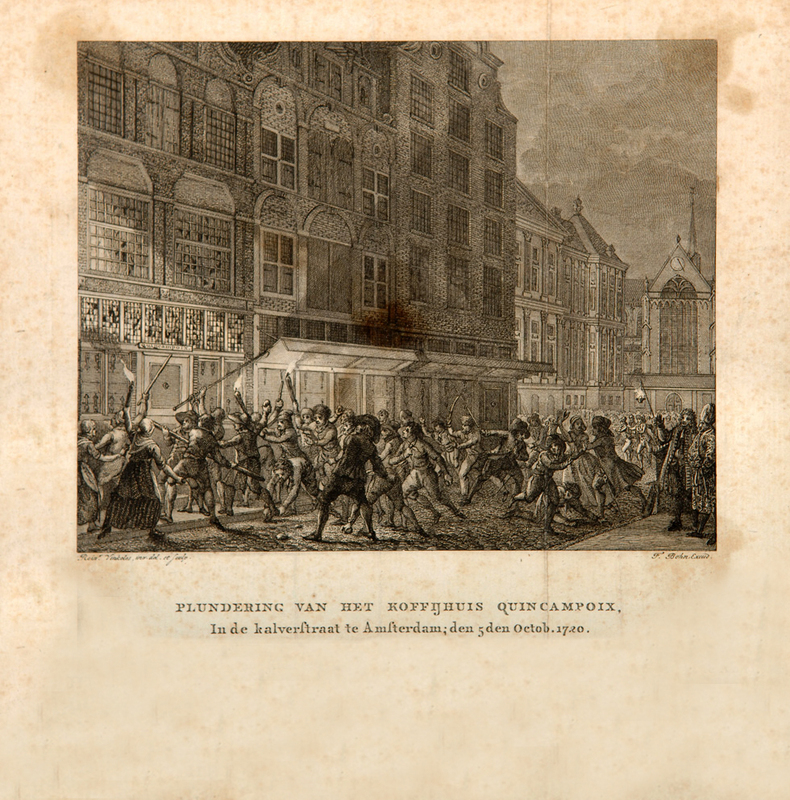 On October 5, 1720, the bubble in the Netherlands bursts. Small investors suffer the biggest financial setback. In anger, they storm the center of the wind trade in Amsterdam: a coffee house near the Dam square. Around 1720, France and Great Britain faced large deficits. To improve the miserable position of their Treasury, debt certificates were exchanged for shares of semi-public companies. In France, it was the Mississippi Company, and in Great Britain, it was the South Sea Company. In exchange for taking over the government debt, these companies received trading monopolies. Until that time, it were mainly the shares of serious companies such as the Dutch East India Company and the West Indian Company, that circulated in the Netherlands. Amsterdam, the financial center, did not want to have anything to do with new, vague funds. The South Sea Company did have a listing in Amsterdam, but that was all. A development similar to the one in Great Britain – where, on top of everything, fake public limited companies (‘Wind Companies’) got listings – was impeded in Amsterdam. Smaller Dutch cities were less diffident. It often occurred that shares were issued from companies of which it was completely unclear what they were aiming for. However, investors saw a chance for profit and got involved en masse, which resulted in price explosions. In Great Britain, the South Sea Company showed a price increase of 800% in six months, and Dutch funds increased with it. The collapse of the South Sea Company ushered in the end of the wind trade. The prices of the companies plummeted and most of them ceased to exist. In the Netherlands, this first international securities crisis was merely an incident. The repellent attitude that Amsterdam, the international financial center, adopted from the start, as well as a highly developed financial system ensured that the consequences of wind trade remained limited in the Netherlands. In France and Great Britain, however, the Wind Trade Crisis led to an enduring national disruption.